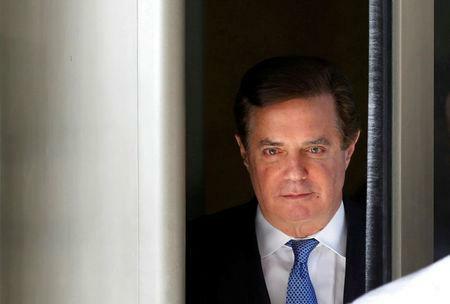 (Reuters) - The chief executive officer of a small Chicago bank that approved $16 million in loans to former Trump campaign chair Paul Manafort was seeking a post in the new administration, a witness testified on Friday in Manafort's fraud trial. Dennis Raico, a former Federal Savings Bank executive testifying under immunity, said the bank's chief executive, Stephen Calk, expressed interest in such posts as Treasury secretary or Housing and Urban Development secretary. Manafort later asked the incoming administration to consider tapping Calk for secretary of the Army, according to testimony earlier in the week. Calk, a retired Army officer and helicopter pilot, did not get the job. Raico was one of several witnesses scheduled for Friday as the trial resumed after a recess that lasted into the midafternoon. He and James Brennan, a Federal Savings executive, were granted immunity against prosecution by Special Counsel Robert Mueller before testifying. The witnesses were the latest in the government's case against Manafort, who faces 18 felony counts of bank fraud, tax fraud and failing to disclose about 30 foreign bank accounts. Four of Manafort's felony counts involve the $16 million of loans prosecutors have said were extended by Federal Savings in late 2016 and early 2017. On Friday, Raico testified that Calk asked him to call Manafort shortly after the Nov. 8, 2016, election, to see if he could be a candidate for the Treasury or HUD post. Raico also described a July 27, 2016, meeting with Manafort during which Calk indicated he would be interested in serving with Trump. The loan was approved the next day. On cross-examination, defense attorney Richard Westling sought to show that Manafort had provided adequate collateral for both the $9.5 million loan he got on a Hamptons property and a $6.5 million loan on a New York City property. Rick Gates, the deputy chairman of Trump's inaugural committee, who also worked on his campaign, testified earlier this week that Manafort had told him to ask about making Calk secretary of the Army. Gates was indicted along with Manafort, but pleaded guilty and has been cooperating with Mueller's investigation. In a filing on Friday, Mueller said Gates is continuing to cooperate with the investigation following his testimony this week. Andres had said in court that he planned to call the prosecution's final witnesses, three of them current or former employees of Federal Savings, on Friday. Friday's lengthy recess derailed the prosecution's plans to wrap up its case by the end of the week. The prosecution is expected to call Brennan and at least one other witness to testify on Monday. T.S. Ellis, the federal judge overseeing the case, said the recess could not be avoided and that he had matters to attend to. He reminded jurors to "keep an open mind," and said that Manafort is presumed innocent. He gave the jury explicit instructions to not talk about the case. It was not clear why, but the afternoon session also was delayed. In addition, prosecutors are expected to call Irfan Kirimca, senior director of ticket operations at the Yankees, to testify about payments for Manafort's season tickets for the baseball team. On the stand on Friday, Raico testified about Gates' claiming he borrowed Manafort's American Express card for the tickets. Earlier this week, Gates said Manafort asked if he would "do him a favor" and sign a letter that attributed the cost of the tickets to him. The box seats cost between $210,000 to $225,000 a year, Gates said. Raico testified the large outstanding balance was counted as debt when being considered for a loan. Other witnesses also have testified that Manafort tried to represent lower debt and higher income in order to obtain loans.